Stock status is current as of 4/24/2019 8:26 AMET. Capture and convert an S-Video or Composite video on your PC or Mac, as digital media. The SVID2USB23 USB 2.0 S-Video & Composite Video Capture Cable offers an easy to use analog video capture solution, enabling you to grab video from an S-Video or Composite video source, as well as the accompanying 2-channel RCA audio, to your Mac or Windows computer. The cable connects to your desktop or laptop computer through USB 2.0, and is compact enough to fit in the palm of your hand, providing a conveniently portable video capture solution that's more than suitable for use with laptops and desktop computers alike. An easy-to-use device for recording analog video to your computer from external sources, such as a VCR or camcorder the SVID2USB23 offers the perfect solution for Betamax or VHS video capture, with real-time MPEG-1, MPEG-2, and MPEG-4 encoding, as well as TWAIN support, to ensure compatibility with a wide range of systems and software. 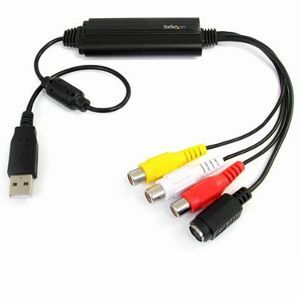 This analog video capture cable supports a broad range of operating systems, delivering seamless analog video capture for Mac computers (OS 10.X), and Windows PCs (Windows 7/8/8.1/10, Windows 2000/XP(32/64-bit)/Vista(32/64-bit)).